Thank you for the invitation to visit your site. After extensive visits, the evaluation was completed successfully. Site with comprehensive content on the spiders, with much information and photos. Congratulations to the webmaster and keep your beautiful work. Mein Name ist Vogelspinne und ich bin das Ein & Alles für meinen geschätzten Meister Tim Beylemans. Er widmet mir ganz persönlich eine wundervolle eigene Homepage. Da erfährst du jedes Detail über mich, meine Eigenschaften und Gewohnheiten. Hast du etwa gewußt, dass ich acht Augen habe? Zwei für den Tag und sechs für die Nacht. Tim läßt keine Frage in Bezug auf mich offen. Er dringt bis in meine Eingeweide vor. Gut, das ist sowas wie Anatomie. Aber dass er mich sogar beim Liebesspiel beobachtet, das grenzt schon sehr an Verletzung meiner Privatsphäre... Dessen ungeachtet bin ich sehr stolz auf meinen Meister Tim. Wer sonst hätte sich so intensiv mit mir beschäftigt? Mein Konterfei ziert sogar seine Awards. Einfach genial, der Mann... ups, sorry, meinte natürlich meinen geschätzten Meister Tim. I am so thrilled with having had the honor of evaluating this site and I so enjoyed it. Your site is very professional and your skill in web design is clearly shown. Your dedication and creativity is shown throughout this site. It is a site which stands out as model for great websites. I am proud to announce that this site has won the Gold Award at Becky K's Awards Program. The site is a top level site, and this is reflected by securing an award from this program. I have now completed the review of your site submission. We are extremely proud to present your site with the Award of Paradise gold Award. Thank you for giving us the opportunity to review your work, the visit was most inspiring. Your effort and dedication shine throughout your pages. You are truly deserving of our highest accolades, and for making the World Wide Web a much better and nicer place for us all to visit. Thank you for your interest in our Awards Program and Congratulations on such a fine web site. The design staff at NWESS is pleased to announce that your site has won the "NWESS Gold Award" Keep up the good work–a good web presence is never finished. It's always a "work in progress". Thank you for the opportunity and honor to evaluate your site. Your site exceeds our criteria in every category+. As our program allows for a discretionary/special award for exceptional sites, I am pleased to award you with our Platinum Award. You are the 8th recipient of this award since our inception in October 2003. Best wishes & please keep in touch. You have a very interesting website and we thoroughly enjoyed evaluating your site. We share your appreciation for the spiders and realize they have a purpose and place in this world. Your site is well designed and one in which others may learn from. We are very honored you gave us the opportunity to evaluate your site. Congratulations! Your site has earned the GrafixGuy's SilverStar Web Site Award with a score of 42 points. We found your site to be informative about the bird spider and your awards program is firmly established and well presented. Keep up the good work. Congratulations Tim Beylemans, your website has won the Fifth Alcazaren Gold Award. The content, design and navegation of the Tim's Spider Corner page has been evaluated with an excellent scoring. It has been a pleasure to re–visit your site a offer you the upgrade. The information about the bird eating spiders is extense and interesting, your website design is superb and perfectly matches it's content, your Award Program and your compliance with the W3C is also considered and shows the effort and dedication put in the enhancement of the website, it clearly deserves the award. I like your site very much, I could feel a lot of head and heart. You spent a lot of effort in creating this site. Lot's of great photos and very interesting information about that fascinating animals. The design is very good – no discussion about it; the creativity and the ideas are just great. Keep on with your good work and enjoy the award! ConCATulations, you won my Gold Award with a score of 98 (out of a 100). You don't know this, but I was at your site many times. I am so scared of spiders that my eyes almost popped out when I read all the spider stuff (so I kept returning :–). If you take a look at my holiday pictures from this year, you will see I met a bigh Huntsmen spider, brrrrrrrr. Scared the hell out of me. But your site is fascinating, cannot say anything else. 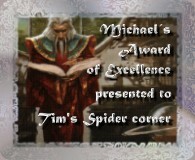 I am pleased to write that your site, Tim's Spider corner has earned the Visions of Adonai "Insight" Award. Our judges awarded your site a score of 50 out of 50 in meeting the selection criteria. The layout, design and content of your site have a clean professional quality that emits an air of both utility and intellectual significance. The colors are appealing and the text is easy on the eye. Navigation is excellent and straight forward, titling is attractive. Your html code was great. Your content is presented in an expert way...you create a love for a very precious species that rarely receives recogition or affection from a vast portion of the global population. There are those rare sites which more then meet our award criteria, sites which clearly demonstrate ability to deliver useful information and package this information in a well functioning and beautifully designed site. Yours is such a site. We would be honoured if you would accept our Weis Awards Gold award. I'd like to thank you for a site well put together. I have completed the process of viewing and evaluating your site. I'm pleased to say that your site has been accepted for my Gold Award. Reviewing your web site was a pleasure all in itself and I truly enjoyed learning about spiders. your website has won the Alcazaren Silver Award. What has been evaluated is the content, design and navegation of the Tim's Spider Corner page. It has been a pleasure to re–visit your website and offer you the upgrade, the information about the bird eating spiders is very extense and interesting, your website design is superb with the sounds perfectly matched, ypour Award Program and your compliance with the W3C needs also to be considered and it shows the effort and dedication put in the enhancement of the website. It well deserves the award. I really love your web site! The design and layout, and easy navigation around your site are top notch! Please accept my award for your site. On Tim's Spider Corner you find a lot if useful information about all kind of spiders, well presented. Here you can learn love spiders :–) The loading time is very quick and I love your design, it is wonderful. I wish you all the best for the future. your website has won the Alcazarén Bronze Award. What has been evaluated is the content, design and navegation of the Tim's Spider Corner page. It has been a pleasure to get in touch with your website and I am very happy to offer you the mentioned award. The information about the bird eating spiders is very extense and interesting, the Facts section was enjoyable, your website design is superb with the sounds perfectly matched, it very well deserves this award. It was a pleasure to visit it. Your site has won a Gold 001 Pikku–Ukko Award. It really pleases me to grant your site an Award. Thank you for asking me to evaluate your site. It was a pleasant task. I will gladly visit your site again. We found your site to be well designed, with excellent graphics, and easy to navigate. 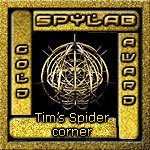 The Spylab awards you with The Spylab Gold Award for TIM's SPIDER CORNER. Your site is a complete encyclopaedia about spiders. Very informative! Nice design and usefully navigation. Compliments! Be proud of your presence in the web! Tim's Spider corner is among the webs best and I am honored to have you listed as a winner of my award and congratulations, for winning PREMIO NAPOLI GOLD Award. The use of color in your site is simply fantastic, it is such a pleasure to award a superb site that meets and exceeds the normal standards of web excellence. Allan and I would like to congratulate you on winning our Gold Compass Award. We were really fascinated by the content and quality of the material you cover in your website. Congratulations!